I think we all remember very clearly where we were and what we were doing the day Srila Prabhupada first entered our lives. Many of the older devotees remember where they were when President John F. Kennedy was shot, or where they were when "The Beatles" appeared on the Ed Sullivan show. But our remembrance of Srila Prabhupada will outlive any mundane event in our lives, as our relationship with our Srila Prabhupada is an eternal relationship. I meet my spiritual master in an unlikely place, in the Chicago O'Hare airport. I was walking through the airport just wandering aimlessly, when I was approached by a sankirtan devotee. He said "hey, you into George Harrison?" I replied "sure I just saw him in concert last night". So he said, "take this book and give it a read, its really far-out!" To make a long story short I took the book, the Krishna Book, and found a place to sit down and read. I couldn't even make out some of the words it was like a foreign language. I couldn't even pronounce some of the words like Srila Vyasadeva or Srimati Radharani. I didn't have a clue what the book was about. But I loved the picture on the cover instantly, and when I turned the book over in my hands I saw the most beautiful sight in this material world, a picture of my spiritual master Srila Prabhupada. I had been thinking lately that I needed to find my guru, as I had been doing a lot of reading on spirituality and had a pile of books on Eastern Wisdom, Hinduism, and Buddhism etc. And had come to the conclusion that I needed to find my Guru. I had no idea where to find him? Do I go to India? I didn't have a clue where to go or who to ask. But the mercy of the spiritual master is unfathomable, and he came to me, through the kindness and compassion of his disciple, in the form of the Krishna Book. The love I felt for the picture of Srila Praphupada was deep and profound. I had never before experienced such a deep loving sentiment as I was experiencing when looking at the picture of His Divine Grace Srila Prabhupada. I was in love as if for the first time. 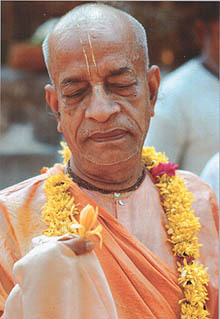 I recognized Srila Prabhupada as my Guru. And I began to associate with him directly through his picture and his words. In one fell swoop I meet my Guru and by his mercy I meet God. From this one encounter of meeting one of Srila Prabhupada's disciples, my spiritual life began. All Glories to the Sankirtan Movement of Lord Caitanya Mahaprabhu! And from there I went on to receive (again by chance) a Bhagavad-Gita "As it Is" and some smaller paperback books. By this time I was associating directly with Srila Prabhupada because I was following his instructions and chanting the Hare Krishna maha mantra. In this way my heart became purified and within the next few years I joined the society of devotees, shaved my head, put on tilak and interestingly became a book distributor on the Radha Damadora Traveling Sankirtan Party. Giving to others what was given to me; Srila Prabhupada & Krishna! It was years after receiving my first book and hearing from my eternal spiritual master Srila Prabhupada that I finally got a chance to meet him personally, in his physical form, and I enjoyed walking alongside him on a morning japa walk, hearing him speak Bhagavatam, and watching him dance at the Rathayatra festival. But for me, the turning point in my life, when my association with my eternal spiritual master began, was at the Chicago O'Hara airport, in the form of the KRSNA Book. I am eternally grateful to that book distributor (I don't even remember his name), for introducing me to His Divine Grace A.C. Bhaktivedanta Swami Prabhupada, and helping me on my journey Back Home, Back to Godhead.